WordPress itself is a very secure platform. But WordPress sites can be an easy target for attacks because of the themes and plugin vulnerabilities, weak passwords and obsolete software. On average, thousands of websites are hacked each day. So if you are running your website on WordPress, securing your website as much as possible is an essential task. Here I have listed most popular and very good free WordPress security plugins for your website. By using this plugins, it will help you to add an extra security to your site with a lot of good security practices. Wordfence Security is a free enterprise class security and performance plugin that makes your site up to 50 times faster and more secure. Wordfence starts by checking if your site is already infected. It will do a deep server-side scan of your source code comparing it to the Official WordPress repository for core, themes and plugins. 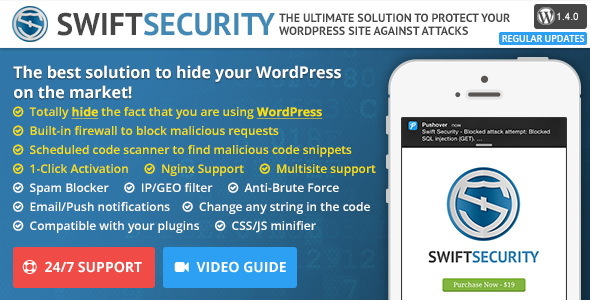 An easiest, most effective way to secure WordPress in seconds. iThemes Security (formerly Better WP Security) gives you over 30+ ways to secure and protect your WordPress site. All In One WP Security & Firewall is comprehensive, user-friendly, all in one WordPress security and firewall plugin for your site. It reduces security risk by checking for vulnerabilities, and by implementing and enforcing the latest recommended WordPress security practices and techniques. BulletProof Security comes with features such as one-click setup wizard, .htaccess website security protection (firewalls), login security & monitoring, db backup features, db table prefix changer, security logging, http error logging, frontend|backend maintenance mode and more. Useful plugin that will scan your theme templates for malicious injections. It has features like virus alert in the admin bar, cleaning up after plugin removal, daily scan with email notifications, database tables and theme templates checks, whitelist solution, manual check of template files with alerts on suspected cases and more. 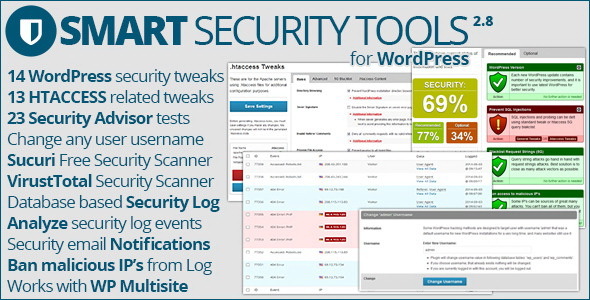 Comprehensive and Easy-To-Use WordPress Security - Comes With Business Grade Support, with no "premium" restrictions. Block Bad Queries (BBQ) is a simple script that protects your website against malicious URL requests. BBQ checks all incoming traffic and quietly blocks bad requests containing nasty stuff like eval(, base64_, and excessively long request-strings. This is a simple yet solid solution that works great for sites where .htaccess is not available. Above security plugins are free and very good. But if you need a premium WordPress security bundle with great support, check below security suits. They will provide great protection to your site. Security Ninja bundle includes these plugins: Security Ninja, Login Ninja, Core Scanner add-on for SN, Scheduled Scanner add-on for SN, Events Logger add-on for SN, Malware Scanner add-on for SN.